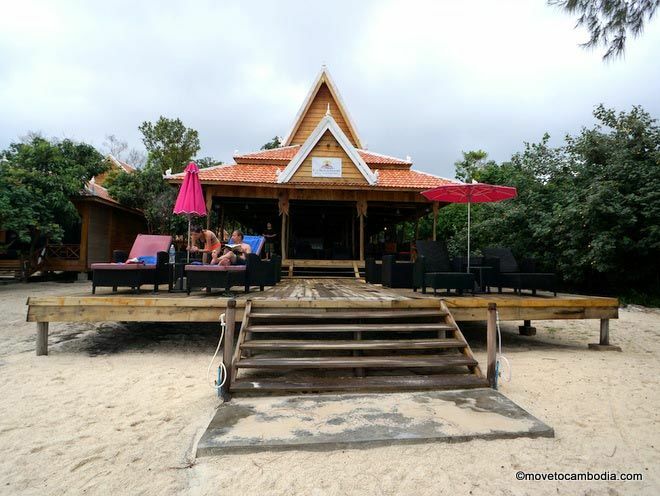 If you’re looking for island luxury, Sol Beach Resort is one of the best offerings on Koh Rong Sanloem. Located on the white sands of Saracen Bay directly facing the sea, Sol Beach Resort aims to be the best accommodation on the island, and the ambition shows. The villas are built to a high standard with small touches — like bedside lamps and tables — that make the island experience more comfortable. The larger villas can sleep up to six people, so it’s a good choice for families. 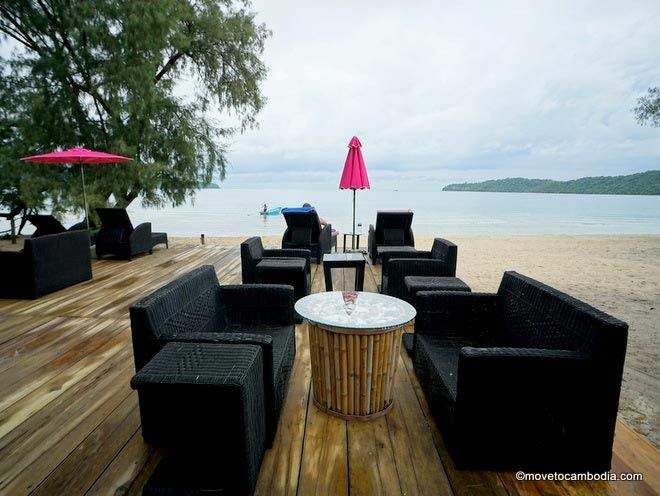 Sol Beach Resort is one of Koh Rong Sanloem’s most high-end offerings. The villas are well appointed and air-conditioned, with electronic safes, 24-hour electricity, and private bathrooms with hot water and a bathtub. Each villa has a private balcony with outdoor seating. We were sad to see that the artwork in the villas was the typical buy-at-the-local-market scenes of Cambodia, as we’d like to see something a little more interesting in such a high-end place. But that’s a small complaint. Beachfront villas have one double bed and a direct path to the ocean. They’re outfitted with sliding glass doors with one-way reflective glass, so that during the day, you can see out but no one can see in, which means you can wake up to views of the sea. They also have the reflective glass separating the bedroom from the bathrooms in some villas, so be warned, when it’s dark out and you have the light on, the glass is no longer one-way! You wouldn’t even know you were on an island (until you look out the glass door at the ocean). 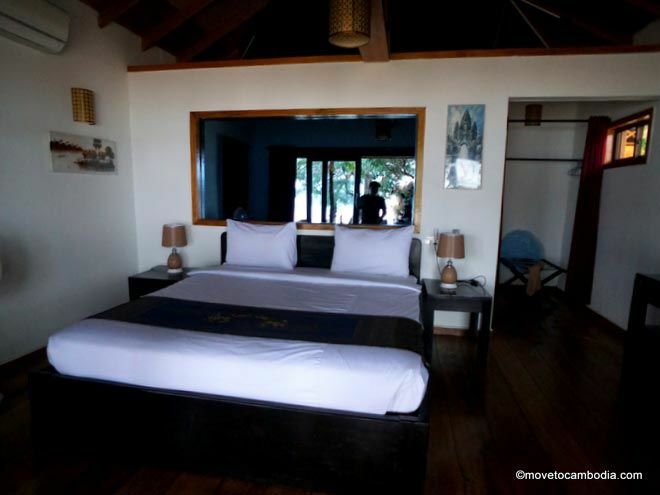 The seaview villas are on the second row back from the beach, but still offer partial sea views. The villas are the same size as the beachfront villas but have a mezzanine level with a semi-full mattress — this is larger than a single bed but smaller than a double, and although they claim it sleeps two, we would argue that it’s meant for one person. The spacious family villas have one bedroom with a double bed, one bedroom with a semi-full bed, a mezzanine level with a semi-full mattress, a private bathroom, and a living room with couch and chairs. Sol’s beachfront restaurant offers unimpeded views of the sea. The attached restaurant, where you can take advantage of the WiFi, offers a full range of food and drink, and there’s also an attached elevated platform with chairs and sun loungers where you can soak up the rays. → Check prices and book a room at Sol Beach Resort on Booking.com now.